Yu-Sheng Liu1, Hsuan-Ying Chen1, Jay-An Yeh1, and Li-Fang Wang*, 2014, “Folate-mediated and doxorubicin-conjugated poly(ε-caprolactone)-g-chondroitin sulfate copolymers for enhanced intracellular drug delivery”, RSC Adv. 4, 59548-59557. (IF= 3.708, 35/148, Chemistry: Multidisciplinary). 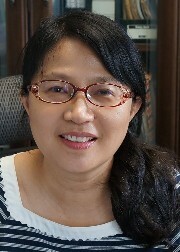 Yu-Lun Lo, Pei-Chi Lo, Chien-Chih Chiu, and Li-Fang Wang*, 2014, “Folic acid linked chondroitin sulfate-polyethyleneimine copolymer based gene delivery system” Journal of Biomedical Nanotechnology (Accepted: Sep 9, 2014, doi:10.1166/jbn.2015.2081). (IF= 7.578, 2/32 Mater Sci: Biomater). Yu-Chih Su, Yu-Lun Lo, Chi-Ching Hwang, Li-Fang Wang, Min Hui Wu, Eng-Chi Wang, Yun-Ming Wang and Tzu-Pin Wang*, 2014 “Azide–alkyne cycloaddition for universal post-synthetic modifications of nucleic acids and effective synthesis of bioactive nucleic acid conjugates” Biomol. Chem., 12, 6624-6633. Guo-Jing Chen, Ying-Zhen Su, Chin Hsu, Yu-Lun Lo, Shih-Jer Huang, Jyun-Han Ke, Yung-Chih Kuo, Li-Fang Wang*, 2014, “Angiopep-pluronic F127-conjugated superparamagnetic iron oxide nanoparticles as a nanotheranostic agent for BBB targeting”, J. Material Chem. B., 2(34), 5666-5675. (IF=6.626, 22/251, Material Sci: Multidisciplinary). Shih-Jer Huang, Zhi-Rong Hsu, and Li-Fang Wang*, 2014, “Synthesis and Characterization of Pluronic-block-Poly(N,N-dimethylamino-2-ethyl methacrylate) Pentablock Copolymers for Drug/Gene Co-delivery Systems”, RSC Adv., 4, 31552-31563. (IF= 3.708, 35/148, Chemistry: Multidisciplinary). Yu-Shiang Peng, Po-Liang Lai, Sydney Peng, His-Chin Wu, Siang Yu, Tsan-Yun Tseng, Li-Fang Wang*, I-Ming Chu*, 2014, “Glial cell line-derived neurotrophic factor gene delivery via a polyethylene imine grafted chitosan carrier”, J. Nanomed, 9, 3163–3174. (IF=4.195, 32/254, Pharmacology & Pharmacy). Guo-Jing Chen, Jyun-Han Ke, Chin Hsu, and Li-Fang Wang*, 2014, “Comparison of chemically and physically coated iron oxide nanoparticles with poly(ethylene glycol)-b– poly(ε-caprolactone)- g-poly(acrylic acid) for imaging and chemotherapy” Journal of Biomedical Nanotechnology, (doi:10.1166/jbn.2014.2012) (IF= 7.578, 2/32 Mater Sci: Biomater). Yu-Sheng Liu, Chien-Chih Chiu, Hsuan-Ying Chen, Su-Hwei Chen* and Li-Fang Wang*, 2014 “Preparation of Chondroitin Sulfate-g-Poly(ε-Caprolactone) Copolymers as a CD44-Targeted Vehicle for Enhanced Intracellular Uptake” Molecular Pharmaceutics,11(4), 1164–1175 (IF= 4.782, 27/261). Chih Su, Hsing-Yin Chen, Ni Chien Ko, Chi-Ching Hwang, Min Hui Wu, Li-Fang Wang, Yun-Ming Wang, Sheng-Nan Chang, Eng-Chi Wang, Tzu-Pin Wang*, 2014 “Effective and site-specific phosphoramidation reaction for universally labeling nucleic acids” Analytical Biochemistry, 449, 118–128 (IF= 2.582, 26/75). Yu-Lun Lo, Guo-Jing Chen, Tzu-Hwa Feng, Ming-Han Li and Li-Fang Wang*, 2014 “Synthesis and characterization of S-PCL-PDMAEMA for co-delivery of pDNA and DOX” RSC Adv., 4, 11089–11098 (IF= 3.708, 35/148, Chemistry: Multidisciplinary). Shih-Jer Huang, Jyun-Han Ke, Guo-Jing Chen, and Li-Fang Wang*, 2013 “One-pot synthesis of poly(2-dimethyl amino)ethyl methacrylate-bound iron oxide nanoparticles for magnetofection” Mater. Chem. B, 1, 5916-5924 (IF=6.626, 22/251, Material Sci: Multidisciplinary). Shih-Jer Huang, Shou-Li Sun, Chien-Chih Chiu, and Li-Fang Wang*, 2013 “ Retinol- encapsulated water-soluble succinated chitosan nanoparticles for antioxidant applications” J Biomater Sci. Polym. Edn. 24, 315-329 (IF= 1.357, 48/82, Polymer Sci). Yue-Jin Lin, Yu-Sheng Liu, Hsin-Hwa Yeh, Tian-Lu Cheng, Li-Fang Wang*, 2012 “Self-assembled poly(epsilon-caprolactone)-g-chondroitin sulfate copolymers as an intracellular doxorubicin delivery carrier against lung cancer cells” Int J Nanomedicine, 7, 4169-4183 (IF= 4.976, 18/249). Shao-Yun Wei, Li-Fang Wang, Yuan-Han Yang, Hsin-Hu Yeh, Yi-Chin Chen, Su-Hwei Chen*, 2012,” Sample stacking by field-amplified sample injection and sweeping for simultaneous analysis of acidic and basic components in clinic application” Electrophoresis, 33, 1571-1581 (IF= 3.569, 12/73). Hun-Yu Tsai, Chien-Chih Chiu, Ping-Chih Lin, Su-Hwei Chen, Shih-Jer Huang, and Li-Fang Wang*, 2011, “The Antitumor Efficacy of Released Doxorubicin From Crosslinked Nanoparticulate Chondroitin Sulfate/Chitosan Polyelectrolyte Complexes” Macromol. Biosci., 11(5), 680-688 (SCI, IF=3.458, 12/79). Chien-Chih Chiu, Yin-Tzu Lin, Shuo-Li Sun, Kuo-Hsun Sung Li-Fang Wang*, and Jenn-Shing Chen, 2011, “Folate-mediated chondroitin sulfate/chitosan nanoparticulate polyelectrolyte complex as a drug carrier for doxorubicin delivery” J Biomaterial Sci: Polym. Edn. 22, 1487-1507 (SCI, IF= 1.842, 25/79).